PUEBLO, Colo. – Gage Gay may be out of competition recovering from offseason knee surgery, but he still can look at the world standings with a sense of pride. One of Gay’s best friends on tour, Chase Outlaw, sits at No. 4 in the standings and is in the hunt for a world title. Gay is happy for Outlaw, and seeing his traveling partner on top only gives him that much more motivation for his own rehabilitation. Gay was assisting Outlaw on the back of the bucking chutes right before Outlaw rode his way to 90.25 points aboard Cochise to finish the U.S. Border Patrol Invitational in third place. Gay made the drive to Georgia a week and a half ago to have a follow-up appointment with Dr. Tandy Freeman. Freeman performed his knee surgery on Jan. 9 to repair his ACL, MCL and meniscus. The doctor gave the 24-year-old good news: Gay said he is about nine weeks away from returning to competition. Based on that timeline, Gay should certainly be healthy for the next PBR Major – Last Cowboy Standing at Cheyenne Frontier Days (July 22-23). Gay tore ligaments in his left knee twice in an eight-month span in 2018. The first instance came on Jan. 13 when the then-No. 1 bull rider in the world disembarked Pit Bull at the Chicago Invitational and his knee gave out on the landing. 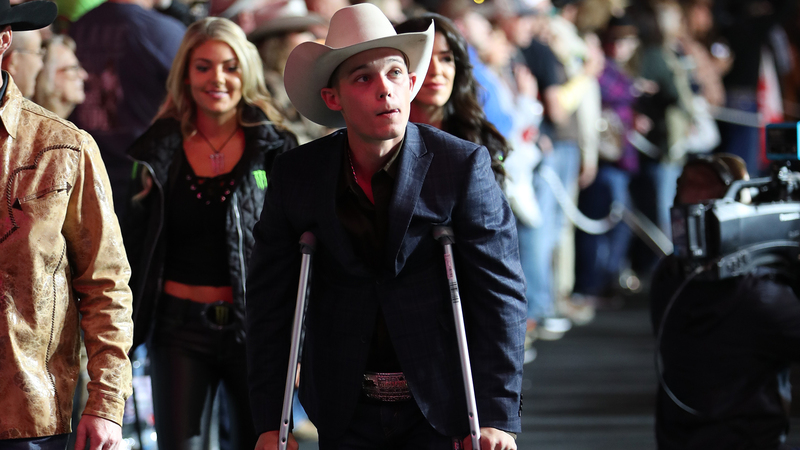 The Staley, North Carolina, bull rider underwent knee surgery in his home state. He returned to action six months later only to tear the surgically repaired ligaments again in the practice pen a little more than two months after going back on tour. Despite two major knee injuries, Gay still managed to qualify for the 2018 World Finals and finished the year ranked 36th in the world standings. The five-time World Finals qualifier still has plenty of time to try to make a run at the 2019 World Finals. Gay still has five injury exemptions from last season, along with the entire summer run to make up ground in the standings. Outlaw, Koal Livingston and Matt Triplett all proved last year that a rider can miss the majority of the first half and still qualify for the World Finals. Gay will continue to go to rehab the next two months as he works toward a full recovery.